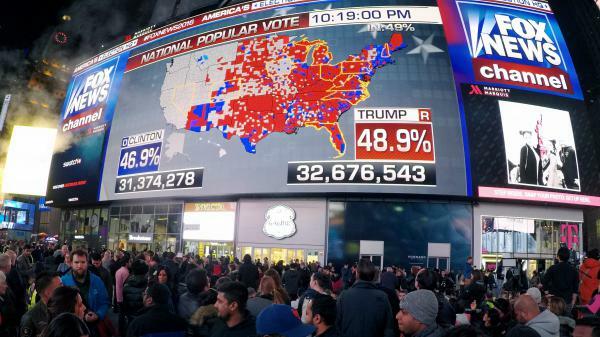 People watch election returns in Times Square on election night in 2016. After the exit polls appeared to be significantly off in that election, Fox News and the AP broke with other news organizations to start a new system. That could mean competing narratives of what happens on Election Day. The exit polls showed Trump won a majority of men, while Clinton won a majority of women. The data for candidate preference tends to be more accurate than the turnout rate for different demographics. As results roll in on election night, pundits and political junkies will carefully be watching the exit polls for a glimpse into who voted for which candidate and why. But exit polls are complicated, and sometimes misleading, as they were in 2016. For one thing, be careful about reading too much into exit polls early in the night. As more data comes in, they can be more useful later in the evening to explain what's happening — more so than predicting results before the polls have closed. Here's a guide to help you figure out what to look for — and avoid — when taking in the data download from exit polls. 1. How do exit polls work? Exit polls are surveys conducted on Election Day outside of polling places in strategic precincts across the country. People are asked not only whom they voted for, but also what issues mattered most to them. All of this data helps news networks project winners. Tens of millions of people vote early, so there's another component to the exit polls: a telephone survey that's conducted to capture those people who either voted by absentee ballots or voted early. The national exit poll is huge. In 2016, more than 100,000 voters were interviewed either by phone or in person at 1,000 different polling locations across the country. But like any poll, exit polls are a snapshot of the electorate and come with sampling errors. Increasingly, there have been questions about the accuracy of those exit polls, particularly concerns that they overestimate the number of young and college-educated voters. For years, there has been one standard exit poll conducted by Edison Research on behalf of a number of national news organizations. But in the wake of the 2016 election, Fox News and The Associated Press pulled out of the National Election Pool media consortium. This year, for the first time, they will be conducting their own polls with NORC at the University of Chicago. Technically, their surveys are not "exit polls," but massive pre-election polls of likely voters. You can read more about their approach here. This means that on election night we'll have two data sets, which may give us competing narratives, but hopefully it will mean a fuller, more accurate portrait of the electorate. We'll start to get the first wave of exit poll results shortly after 5 p.m. ET, but a lot of that data is incomplete. One major takeaway from these early exit polls is the salience of particular campaign messages and public policy. Issue polling can be a helpful proxy for partisanship. In 2016, we saw that far more Republicans than Democrats considered immigration to be the most important issue facing the country, something that contributed to Trump's victory. Ahead of the midterms, the two most prominent issues have been health care and immigration. President Trump has consistently tried to energize his base by stoking fears over illegal immigration. Meanwhile, Democrats have tried to refocus this election on health care and the need to maintain the Affordable Care Act. The degree to which we see voters emphasize either of those issues in their exit poll responses could be a sign of higher Republican or Democratic engagement. Exit polls are not particularly accurate in determining the composition of the electorate (the turnout rates for distinct demographic groups like on the left side of the graph below), but the data is more useful in helping us understand voter preferences for a particular candidate. 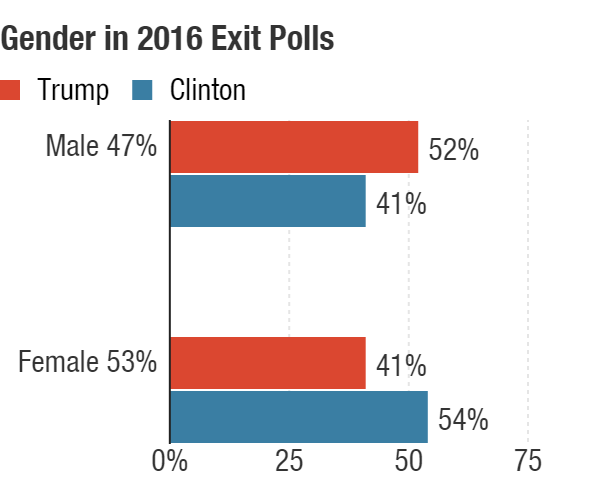 The 2016 exit polls showed that a majority of men supported Trump and a majority of women supported Hillary Clinton more reliably than it showed turnout rates for various groups of men and women. History tells us that women, minorities and young people are all more likely to vote Democratic. And white, non-college-educated men are more likely to vote Republican. On election night, pay attention to whether there's a substantial uptick in the Republican or Democratic preference for any of these demographic groups. Many races for the House of Representatives will be fought in the suburbs, and how white suburban women vote this year will be key. That's a tricky demographic to single out in an exit poll, but it will be telling if there are any major shifts in the preferences of two groups: white women and married women. We'll also pay attention to whether the traditional advantage Democrats have with women overall surges this year. The flip side of that gender dynamic is men, and we'll watch whether the preference men have had for Republican candidates moves substantially. In any group, small shifts from past years could just be statistical noise. But big swings likely show real shifts that explain how the night is going. Getting an accurate picture of the electorate through exit polls is incredibly difficult, especially as more people vote early. In recent years, critics have expressed concern that the traditional exit polls are incomplete and misleading with a Democratic bias. Given that early exit polls favored Hillary Clinton over Donald Trump in 2016, there's reason to believe the critics have a point. Post-election analysis from the Pew Research Center confirmed that the exit polls have a major problem when it comes to estimating turnout. Pew conducted analysis involving official voting records to create an alternative portrait of the electorate — one that in 2016 turned out to be older and less educated than originally thought. The Pew data found that the traditional exit polls in 2016 grossly under counted both the white non-college population and the rural population. According to Pew, 44 percent of all 2016 voters were white people without a college degree. But according to the exit polls, only 34 percent of voters were white non-college graduates. That means the exit polls in 2016 underestimated the blue-collar population that was largely responsible for putting Trump over the edge, and overestimated the white-collar population. According to exit polls, 37 percent of all voters were white college graduates, but according to Pew's data, only 30 percent of voters were white college grads. Despite the difficulties in accurately assessing turnout, we know the white college population has slowly been tilting away from the Republican Party, and so on Tuesday night we'll be watching whether there's an uptick in their preference for Democrats. When election results start rolling in tomorrow night, pundits and political junkies will be watching exit polls. They're hoping for a glimpse into who voted for which candidate and why. But as many found out in 2016, exit polls can be complicated and sometimes totally misleading. Here to guide us through what to look for and avoid when watching those polls is NPR's Asma Khalid. Hey, Asma. ASMA KHALID, BYLINE: Hey, Ailsa. CHANG: So even before the first polls close, we'll start to see some exit poll numbers. What can we even find out at that point? KHALID: Well, at that point, I would say I will be watching the issues very carefully. Issue polling can be kind of a helpful proxy for partisanship. You know, we saw that in 2016 when we saw far more Republicans than Democrats say that immigration was the most important issue facing the country. And, you know, ahead of these midterm elections, there have been two prominent issues, and those have been health care and immigration. And Trump has really tried to energize his base by stoking fears over illegal immigration, while Democrats have really been trying to focus on health care and the need to maintain the Affordable Care Act. You know, so the degree to which we see voters emphasize health care over immigration, or vice versa, in those exit polls could be a sign of higher Republican or Democratic engagement. CHANG: I mean, one of the things we actually look for in exit polls is how different types of people voted. But in 2016, those numbers were problematic. So how are we going to be taking those in this time around? KHALID: Yeah. I mean, they were. And exit polls don't have a recent history of being incredibly accurate with estimating turnout for different groups of people. But they are really useful in helping us understand whether people prefer a Democrat or a Republican. And, you know, we know that young people and minorities tend to vote more Democratic. And we know that white men, particularly men without a college degree, tilt toward the Republican Party. But on Tuesday night, we're going to be watching to see if they lean harder in either direction. And so, you know, in any group, small shifts from election to election could just be some sort of statistical noise. But big swings could actually indicate real shifts that will explain how the night is going. And in a lot of the House races, those are going to be fought in the suburbs. And so the key group that I'll be looking at are suburban women. We can't exactly look at that demographic very clearly in exit polls, but we will be keeping an eye on white women and married women. You know, on the flip side, we'll want to watch if men are moving even more into the Republican column. CHANG: I mean, you just mentioned that turnout for different groups is hard to assess on election night with these exit polls. Why is that? KHALID: Well, part of it is because more and more people are voting early, and the exit polls, which are largely conducted outside of polling places across the country, have just struggled to capture the electorate completely. KHALID: ...Over Donald Trump. And after the 2016 election, the Pew Research Center did this fascinating analysis involving voting records and found that the 2016 electorate was actually older and less educated than what we originally thought from the exit polls. And it means that the exit polls underestimated the blue-collar population that was really key for Donald Trump's victory. So you know, Ailsa, the people who run the exit polls have tried to make big improvements. And this year, for the first time, we'll also have another big survey from Fox News and The Associated Press, which is actually a massive pre-election poll. So what that means is that we're going to have two data sets, which might actually give us competing narratives. But I'm hoping that they actually give us a, hopefully, more accurate picture of the electorate. CHANG: A lot to sift through. All right, that's NPR's Asma Khalid. Thanks, Asma. (SOUNDBITE OF ODESZA AND ZYRA SONG, "SAY MY NAME") Transcript provided by NPR, Copyright NPR.